Warning: This post contains spoilers for the movie Mission: Impossible - Fallout. 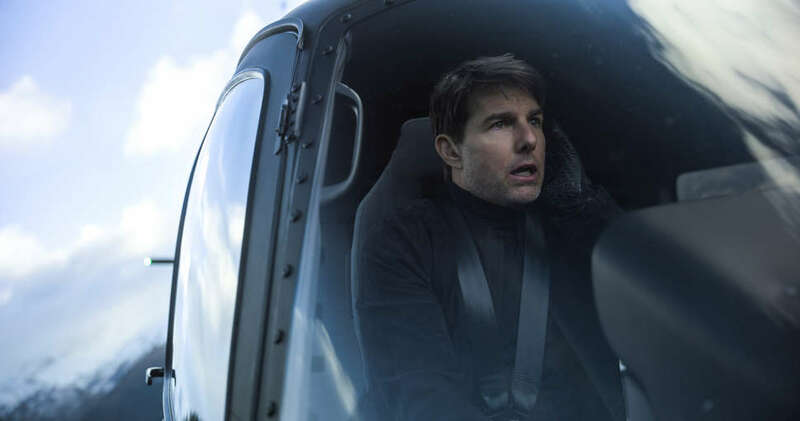 Serialization has never been the primary goal of the Mission: Impossible film series, which kicked off with director Brian de Palma's mask-ripping, helicopter-crashing, sweat-dripping 1996 original. 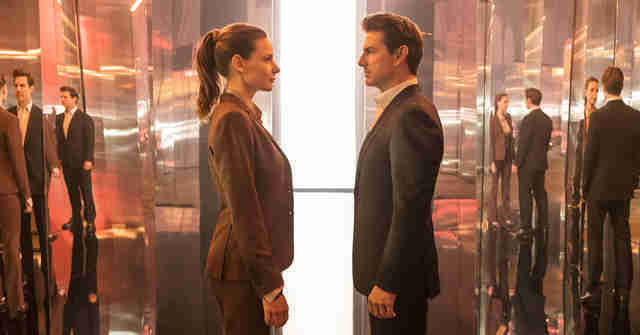 In the two decades that have passed, the larger Hollywood franchise machine has transformed, prioritizing chapter-like sequels and expanded universes over standalone spectacle, but 52-year-old star Tom Cruise is still risking (and breaking) his limbs to entertain the masses with each new adventure as super-spy Ethan Hunt. The latest movie in the series, Mission: Impossible - Fallout, is another ridiculously entertaining, thrillingly ludicrous popcorn contraption that requires practically no prior knowledge of the character to put the pieces together. And yet, Fallout does modify the formula in some small yet significant ways: This is the first entry helmed by a returning filmmaker, with Rogue Nation mastermind Chris McQuarrie back in the director's chair, and it's the first to make an effort to connect the dots between Hunt's various globe-trotting escapades. In the same way Skyfall attempted to reckon with James Bond's complicated past to arrive at a larger poetic truth about the character, Fallout digs deep into what makes Hunt tick while still delivering the elaborate stunts, outlandish plot twists, and droll zingers that make this the most reliable blockbuster behemoth running. Our mission, which we dutifully accepted, was to unpack some of the stray references, Easter eggs, and possible allusions to past M:I films that popped up between all the bathroom brawls, rooftop foot-chases, and nuclear weapon disarmaments. We kept our eyes peeled for connections and reoccurring characters throughout the movie's surprisingly brisk 148 minute runtime. Luckily, this post will not self-destruct before you finish reading it. Early in Fallout, we meet one of the newest characters in the series: Vanessa Kirby's White Widow, a mysterious arms dealer who gives a speech to a group of equally shady potential arms buyers in the back of a French nightclub. (It makes slightly more sense in the context of the movie!) Her presentation to the assembled baddies, which Hunt ends up interrupting with some hand-to-hand combat, includes a reference to her mother, Max. "Max was something of a paradox," says White Widow. For long-time fans of the series, Max is more than a paradox: She's a character from the 1996 original played by Vanessa Redgrave. In the film, Hunt must go on the run after the other members of his team -- including a gum-chewing Emilio Estevez -- are killed in a set-up involving a "NOC list" that contains the real names of IMF spies across the globe. He sets up a meeting with the mysterious Max, who he reaches via the biblical e-mail address "Max @ Job 3:14," and discovers she's not exactly the maniacal, evil figure he was expecting. She's actually kinda charming and funny. Kirby's White Widow ends up serving a similar morally ambiguous role in McQuarrie's story, toeing the line between friend and foe. She's definitely not "good," but she's not exactly bad either -- just like her mother. (Kirby herself has confirmed the connection in interviews.) It's the type of clever reference that won't trip up new viewers, who would have no reason to remember Redgrave's turn in the original, but might prompt a few knowing laughs from viewers who have been following Hunt's journeys since the dial-up internet days. This one's a bit more self-explanatory. 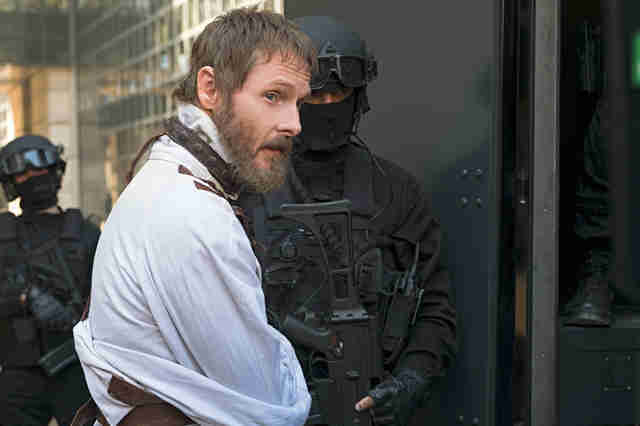 Where previous films in the series like Mission: Impossible II and Mission: Impossible III pretty much wiped the slate clean on non-Hunt characters -- Ving Rhames' ultra-trustworthy Luther is the only other constant in the series -- Fallout brings back a handful of familiar faces from 2015's McQuarrie-directed Rogue Nation. That includes Sean Harris's former MI6 agent-turned-anarcho-terrorist and leader of The Syndicate, Solomon Lane. If you didn't re-watch Rogue Nation in the run-up to Fallout, you might not remember that the previous movie didn't end with Hunt dispatching Lane with a piece of explosive gum or facing off in a motorcycle duel. Instead, Hunt trapped him in a glass cell and handed him over to the authorities, who have spent the years between movies passing him off in a game of clandestine prisoner-hot-potato. The plot of Fallout forces Hunt to break out Lane, which triggers one of the movie's most exciting, Nolan-like action sequences. Lane may not have the main villain role here -- that goes to the mustachioed Cruise doppelganger played by Henry Cavill -- but he does get some of the movie's best scenery-chew-ey dialogue, including the killer trailer line, "The end you always knew is coming." Solomon Lane is not the only carry-over from Rogue Nation. Though Jeremy Renner's William Brandt does not return -- the Tag actor was apparently too busy not appearing in Avengers: Infinity War to have a part here -- breakout star Rebecca Ferguson, who plays MI6 agent Ilsa Faust, does make another appearance. Again, she steals her scenes with a combination of deadly force and steely determination. While the idea of Renner's Brandt getting his own spin-off, which was rumored back when Mission: Impossible -- Ghost Protocol was first released, has fizzled, Ferguson's Faust more than deserves her own solo adventure. Julia was the main focus of Mission: Impossible III, J.J. Abrams's "this time it's personal" entry in the series. It's reasonable to think she might not fit into the slightly more absurd comic tone of the McQuarrie films, but Monaghan and Cruise bring an oddly touching poignancy to their scenes together. During the Kashmir-set finale, we learn that she's now married to a doctor played with just the right amount of smugness (and sweetness) by Wes Bentley. Hunt is happy for her, allowing the movie to explore an emotional tenor you're more likely to see in a mumblecore movie about a divorced couple than in a summer explosion-fest. At the same time, it works! OK, I don't know if this one is actually a reference, but I'd like to think that the rock-climbing section of the stunning final helicopter battle is a playful callback to the opening of Mission: Impossible II. In the same way the extended chase scene in Fallout tweaks the Shanghai chase in Mission: Impossible III, the cliff showdown riffs on the classic M:I II opening stunt. John Woo's operatic take on the series is often placed at the bottom of rankings and considered a misfire by many critics, but I have a soft spot for it, particularly the way Woo introduces Hunt by having him dangle off a cliff in a black tank-top. He shoots Cruise like a mythical being but still understands his humanity. 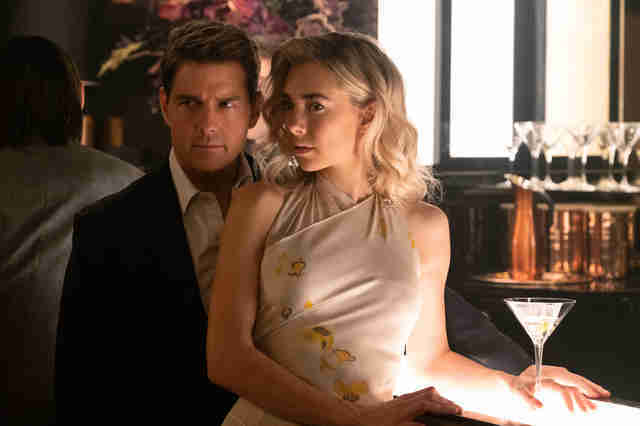 The M:I II scene is easy to mock for its soundtrack and the way the camera lingers on Cruise's windswept hair, but in a way it's a blueprint for what makes the Mission: Impossible movies so addictive: We want to see Cruise struggle and triumph in equal measure. No ropes. No harnesses. No fear. Just one clearly troubled action hero leaping around in slow-motion. Who needs continuity when you have moments of transcendence?